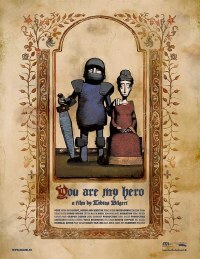 Tobias Bilgeri’s animated short film YOU ARE MY HERO about the wife of an unfaithful knight has just been invited to the 2009 Cannes Film Festival. For an animated film just as important has been the invitation to be shown at the Film Festival of Annency. UVASONAR Media has been providing the score and post production services for this outstanding production.